What I learned from Waffle Church… | gather the folks. tell the stories. – a seed which, once removed from the jar by one or many small children, will find its way under the table, into the cracks between the floor boards, and buried with hundreds of its mustard seed friends in the church’s backyard, where it is then fed with the water from the baptismal bowl. – a seed which, according to a four year old, will sprout between the floor boards and crash through the floor and then through the ceiling where the birds will gather around it and then (my apologies on behalf of the the four year-old, who, in all truth, belongs to me) poop through the branches. 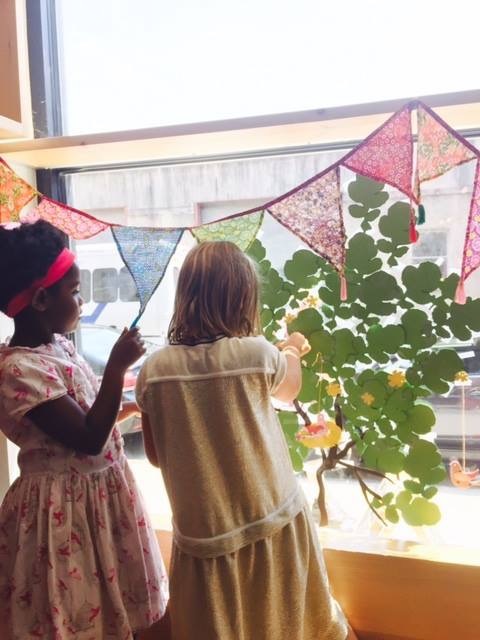 – a seed which, while meant as a simple sermon illustration, will become a source of endless amazement and curiosity and entertainment to all the children gathered, who then become a source of endlessness amazement and curiosity and entertainment to all the adults who get to watch the children who are watching the mustard seed. Teru and Claire with the Mustard Bush. – a seed which, though tempting to consider, will not taste good on the from-scratch waffles served with lemon curd, cinnamon butter and summer fruit salad. 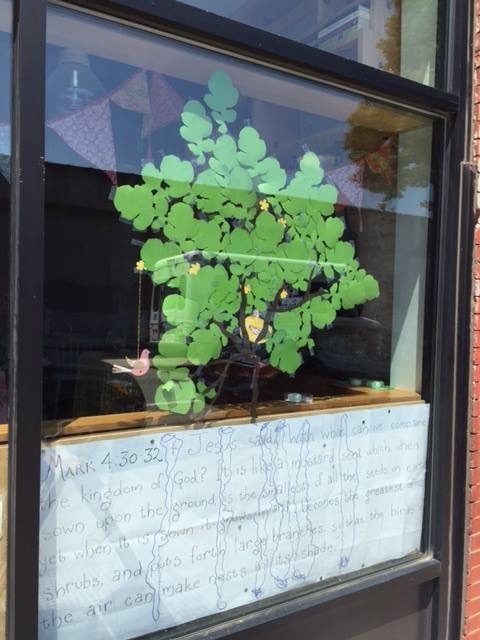 – a seed which, like a jumping bean in your back pocket, incites you, with the others around you, to stand up, and move around, and sing with your body, and tape green, cardstock mustard leaves to the church’s storefront window. – a seed which is unstoppable, finding its way into every nook and crevice, including the cracks in our broken and wounded hearts, reminding us that God will find a way in, no matter what. That’s what I learned about the Kingdom of God today at Waffle Church! 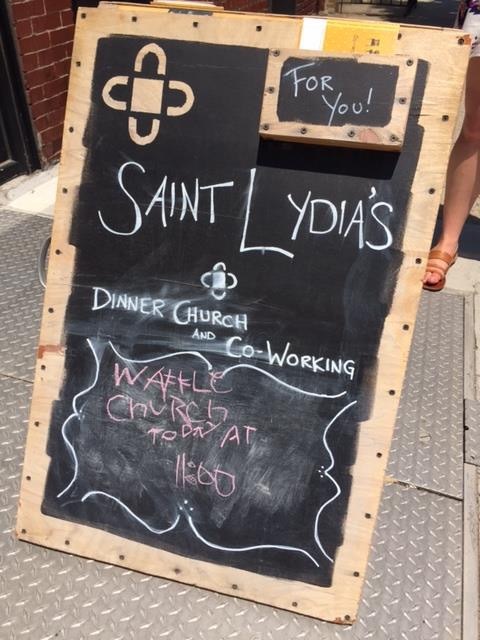 This entry was posted in Discipleship, Sermons, St. Lydia's, Waffle Church and tagged baptism, blessing, Brooklyn, children, Lord's Supper, mustard seed, parable, sermon, Waffles, worship. Bookmark the permalink. Do you really have waffles?? ?